This post is actually to share a fantastic find I made at Cost Plus World Market. But some background…. Maybe I have lived a sheltered life but I had never tasted truffles before a few months ago, let alone truffle salt and truffle oil. Truffles were never on my radar. They are never found on grocery shelves. They are not commonly cultivated and need to be sniffed out of the ground by dogs or pigs. (There are attempts at cultivating truffles, but it’s not like growing normal fungi as I learned here.) They are in fact one of the rarest and most prized delicacies on the planet. A company called Sabatino Tartufi in Umbria, Italy has been truffle hunting for over 100 years and has developed quite a following in culinary circles. They have an amazing line of truffle products, including truffle salt, oil, honey, truffle rice mixes, truffle face cream, and of course, truffles, that they ship all over the world. 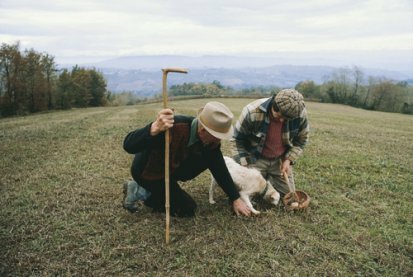 They will even take you and a group of 9 others truffle-hunting in the countryside with their specially trained dogs and will serve a truffle-laden lunch for $1500 if you’re planning to visit Umbria. Their products can be ordered online or, as I discovered, three of them are available at the ubiquitous Cost Plus World Markets. I just discovered how fascinating these stores are; one quarter of the floor space is devoted to imported wines, beers, and food items impossible to find anywhere else. 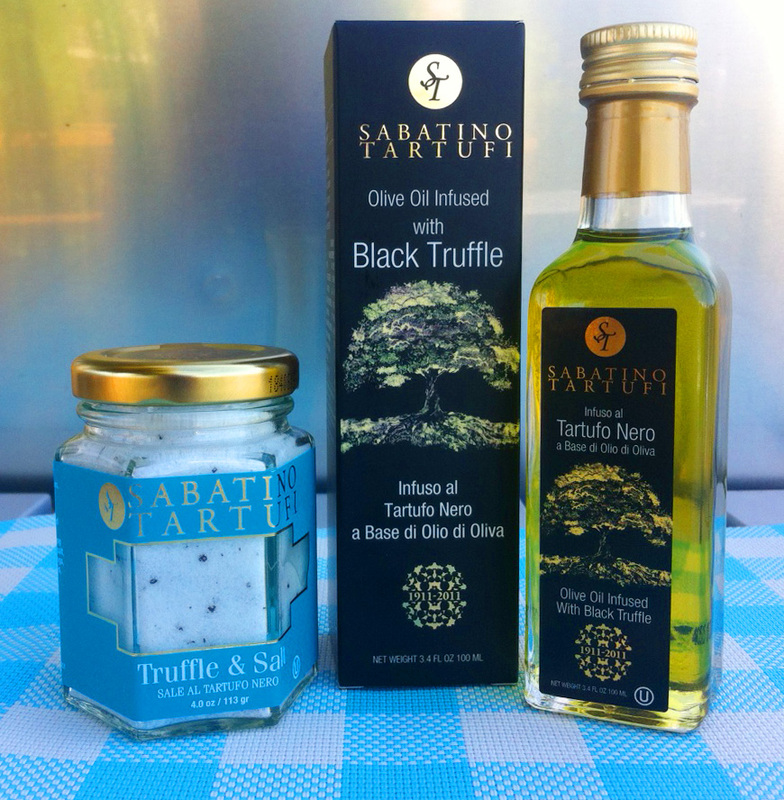 I found the Sabatino Tartufi Truffle & Salt ($12.99) blend there as well as their Olive Oil Infused with Black Truffle ($9.99). They also sell the white truffle oil ($9.99). These items launch everyday fare out of the ballpark with flavor. Apparently Oprah Winfrey is a huge fan of this company’s products. For what that’s worth! And now, so am I! I had a truffle’d pizza in Rome once – there was a level of richness to it that was almost overwhelming for my American palate. Which is a great homonym: talking about the palette of the American mouth. Probably much easier on the American palette to absorb the flavor through oil and salt. 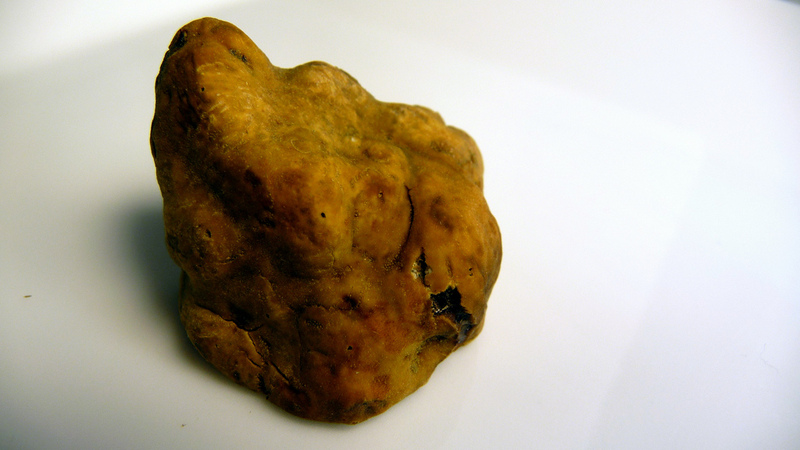 Eating an actual truffle must be overwhelming, which is why they chop it into tiny pieces. BTW, I saw dried truffles in a very small bag alongside the other dried mushroom packets in the produce area of Safeway today. Surprise! On sale for $26.99, about one ounce or two, amazing. They do look like little brains.